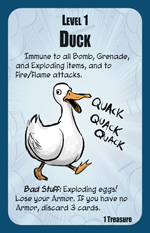 Munchkin players have long known that picking up a duck in a dungeon is a bad idea. This is true even . . . especially! . . . in Munchkin Axe Cop. 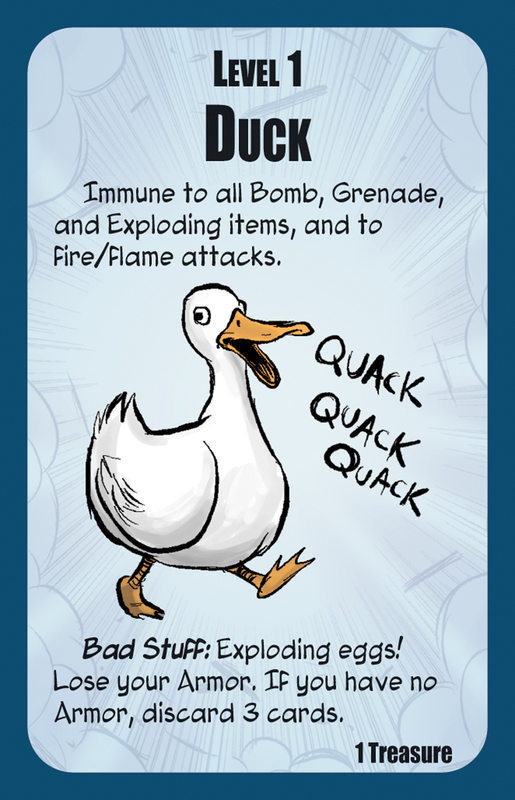 Duck may be just a level 1 monster, but since it's immune to Bomb, Grenade, and Exploding Items, as well as Fire/Flame attacks, you'll need to work for that one treasure. And if you fail -- say because someone added . . . Of Doom! to the Duck (which would be completely cheating, since . . . Of Doom! is an Item Enhancer, not a Monster Enhancer -- ed.) -- you not only suffer the shame of falling before a mere waterfowl, you lose your Armor! Duck is part of Munchkin Axe Cop, due out on store shelves in early November.